The inherently quiet nature of kayaking enables paddlers to observe the birds and marine species living among the mangroves without disturbing them. Organised tours set out from Savaneta, making their way up the coast to popular spots such as Mangel Halto and the Spanish Lagoon. These tours offer knowledgeable guides and usually include snorkelling, swimming, beach time and lunch for an entire morning of enjoyment for the whole family. The calm waters of the Spanish Lagoon, a narrow inner bay 2,000 metres long and up to 500 metres wide, are ripe for exploration by kayak. Due to the tidal action, a special wetland ecosystem has emerged, resulting in a high biodiversity. Besides a natural habitat for waterfowl, the inland bay is also an important nursery for reef fish and crustaceans. Spanish Lagoon is so unique that it is part of the Ramsar Convention. 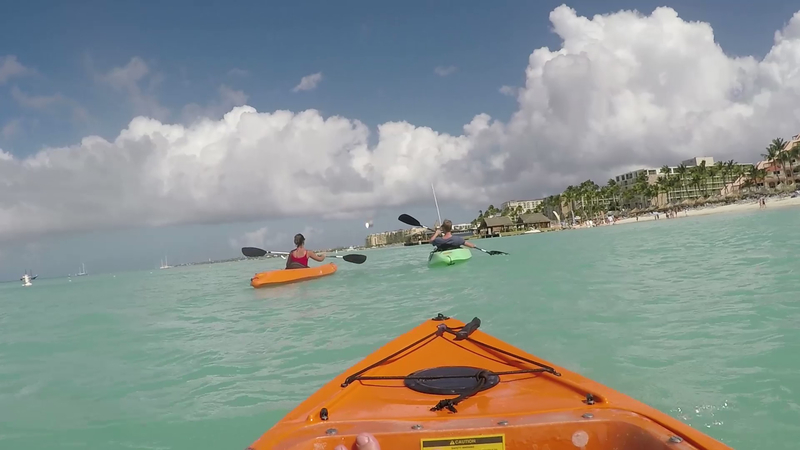 If you prefer to explore the shores closer to the hotel area, many resorts and activity providers along Eagle Beach and Palm Beach also have kayaks for rent.